As the days grow warmer over the spring and summer months, you may find you spend so much time in the garden, that it almost becomes an additional room to your home. The garden has come to fulfil more functions than ever: play area, dining area, storeroom, vegetable patch. So how is it best to divide your outside space? Our freestanding trellis panels are a great way of enclosing and dividing areas of your garden, particularly where space is very limited. It’s a strange paradox, but dividing up a garden can actually make it feel bigger. By dividing your garden you can hide less attractive, utilitarian areas. Trying different styles within a single area will also add interest as it means you can increase the range of plants that you grow. 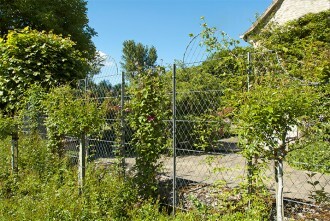 Our wirework garden trellis panels provide a robust framework for your climbing plants. Cover your trellis with quick-growing climbers such as clematis or sulphur heart for a natural semi-transparent screening. Our metal trellises are a superior alternative to a wooden trellis as they are corrosion-resistant, allowing your plants to grow undisturbed for many years. Highly adaptable, you can choose from our standard range or we can cater for bespoke sizes and designs.